The capital of Egypt and amongst the 20 largest cities in the world, Cairo is usually a visitor's first port of call into this ancient land. This bustling city is close to many pyramids including the Pyramids of Giza and the Saqqara Pyramids and the less known ones at Dahsur. While in the city a visit to the Egyptian museum is also a must. Founded by Alexander the Great in 331BC on the Mediterranean coast it became the largest city in the world in only a hundred years. It was home to greatest library in the ancient world and also the legendry Lighthouse of Alexandria, considered one of the Seven Wonders of the World. Aswan is near major monuments including the Abu Simbel Temples and the Temple of Philae which were rescued from the construction of the immense dam that carries its name. Luxor, once known as the ancient city of Thebes, has the Temple of Karnak, the Luxor Temple and is close the Valley of the Kings. Just outside of Cairo you will find the most famous pyramids in Egypt, the Great Pyramid of Cheops, Kafre's Pyramid and the Pyramid of Menkaure along with the Great Sphinx of Giza. This valley is home to the tombs of dozens of Pharaohs including the most famous, Tutankhamun. A list of typical cuisine from Egypt, including main dishes and desserts, and what they contain or are in English. Cairo, the capital of Egypt, is normally a visitor's base for exploring nearby pyramids though the city itself has a lot to offer. 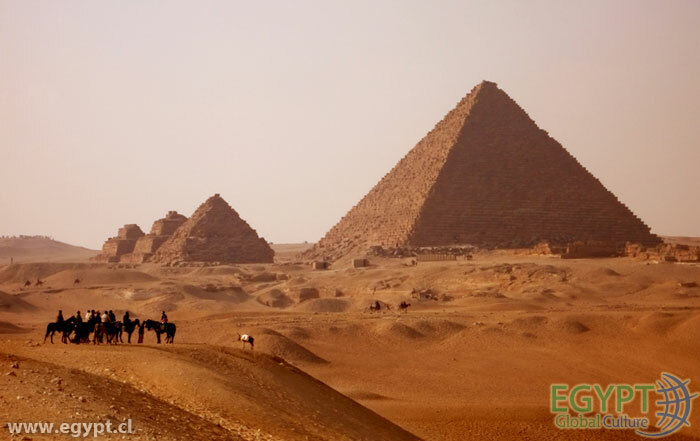 Just outside of Cairo you will find the most famous pyramids in Egypt along with the Great Sphinx of Giza. © 2003-2016 Woodward Ltda - All Rights Reserved.